With the signing of the Armistice on Nov. 11, 1918, World War I ended abruptly. The nation was drunk with victory, and the returning doughboys were anxious to make up for lost time as quickly as possible. The fall of 1919 was not an auspicious time for serious study of chemistry. 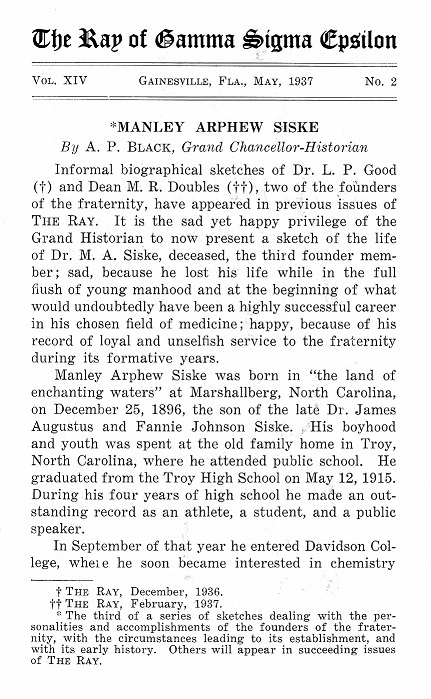 Two of those returning soldiers, (Louis P. Good) and (Manley A. Siske), at Davidson College were convinced that an honorary chemical fraternity, which would recognize undergraduates, would help lead students to a more serious study of chemistry. There had been a local Alchemist Club on campus which tried to recognize the outstanding chemistry students, but this was not enough for these ambitious young men. They envisioned an organization of national scope that would command more respect and interest. 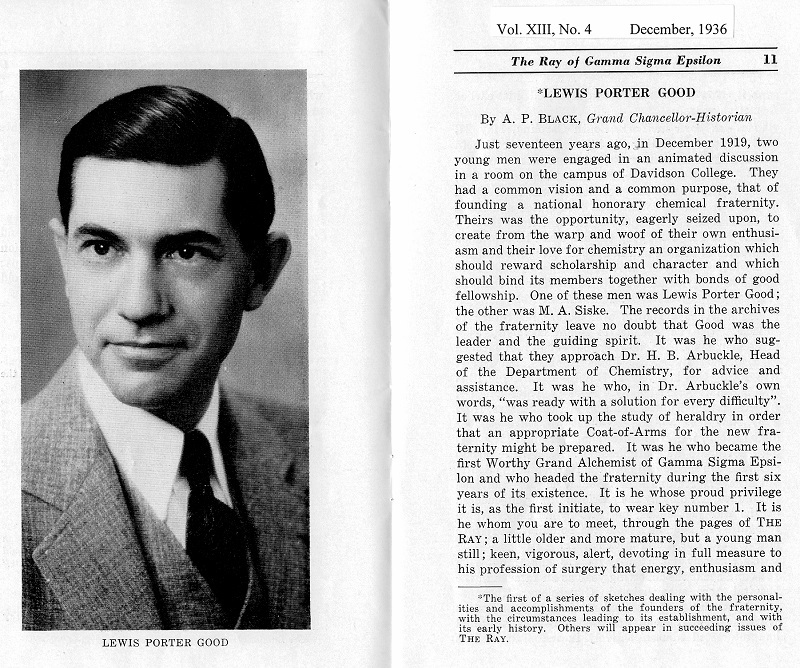 Many lively discussions were held in the old Martin Chemistry Laboratories at Davidson about the merits of one and another existing chemical fraternity, but none fulfilled the requirements and ideals of these young men. So, they decided to start a new fraternity and make it national in scope by sharing it with other colleges. Good and Siske invited another younger chemistry student, (Malcolm R. Doubles), to join forces with them. In October 1919 these three, with the advice and cooperation of the chemistry faculty, began working on the details of the organization. The undertaking was great. First, a name or handle had to be chosen. After much deliberation, and for reasons which must remain secret, the name Gamma Sigma Epsilon was chosen. Following this, there had to be prepared a Ritual, including a short history of chemistry, an initiation ceremony and a design for the initiation paraphernalia. The exact date of the first meeting for the purpose of declaring that the organization had been founded is uncertain. It was either the middle of December 1919 or January 19, 1920. Strong evidence, according to Prof. O. J. Thies, who as a charter member, seems to favor the December 1919 date. Here by the dint of long, hard and sometimes exasperating work, a dream culminated in a living reality - Gamma Sigma Epsilon. 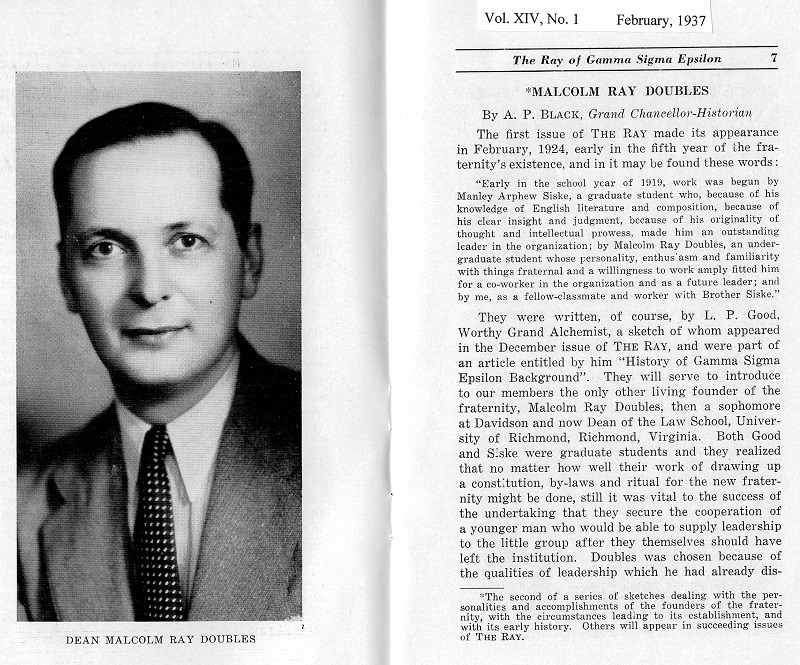 At a later date, Malcolm Doubles summed up the purpose of the fraternity when he wrote "...we might very well say that the purpose of the founding of Gamma Sigma Epsilon was to unite those men with a high scholastic grade in chemistry, in Class A colleges, in order to foster a more comprehensive and cooperative study of that great branch of science and its immediately allied studies." After many proposals it was decided that chapters would be designated by two Greek letters, the first letter to indicate the state in which it is located, and the second the number of the chapter in that state. Thus the Davidson mother chapter, the first in the first state, was Alpha Alpha. The purpose and ideals of the fraternity were communicated to several other institutions; interest was aroused at once. On February 14, 1921, slightly more than a year after the founding, the Alpha Beta Chapter was installed at North Carolina State College in Raleigh. In less than another year the third chapter, Beta Alpha, at the University of Florida, joined the fold on Dec. 16, 1921. By 1925, Gamma Sig boasted 5 chapters. The expansion program was launched. New chapters were added at the rate of about one per year. A few of these were planted in thorny ground and soon perished. But for the most part, they have grown into strong active chapters. In 1931 the "fraternity" went co-ed and became an "honor society." To maintain unity, the Constitution provided for assemblage of chapter delegates in biennial conventions. The first convention was held at Davidson in the spring of 1920. There was only one chapter, Davidson, to be represented at this "national" convention. The founders and members of the Davidson chapter were there. Gamma Sigma Epsilon is now firmly established and regarded with high esteem. Gamma Sig now has approximately 80 active chapters in 25 states and has inducted over 16,000 members since its inception. It is an inspiring organization and one of which we are rightly proud to be a part. An invitation to membership in Gamma Sigma Epsilon is a coveted honor among students in chemistry. Truly it has in a large manner achieved the ideals of its founders.